I did it. I said I wouldn't but I did it anyway. What did I do? 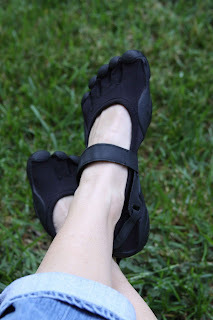 I bought them...the Vibram Five Fingers. Even though way back in May I said "No Five Fingers for me. ", here I am with my very own pair. I know. Now I have to take back all that stuff I said about them. Like the fact that I felt very amphibian in them. And that I might be sabotaging my marriage if I wore these. Well, I don't get the amphibian effect in these, mainly because they are black and not the aqua-camo that I had tried on back in May. I like to think of these as Mary Janes, only in neoprene not patent leather. And with toes, not smooth rounded fronts. And as far as the effect on my marriage, I have clarified with my husband that the only shoes I am not allowed to show up in are white Keds and gold ballet flats. Those are deal breakers. The Vibrams are allowed. I have agreed to avoid the shoes on his list, and he has agreed to never drive an El Camino. These are the things that hold us together. But back to the Five Fingers...they are so comfortable. I knew it when I tried them on in May, in June and again in July. Honestly, I tried them on several times because of the comfort. It's like being barefoot only without the fear. Fear of stepping on a Lego. Fear of stubbing your big toe. Fear of the unknown. 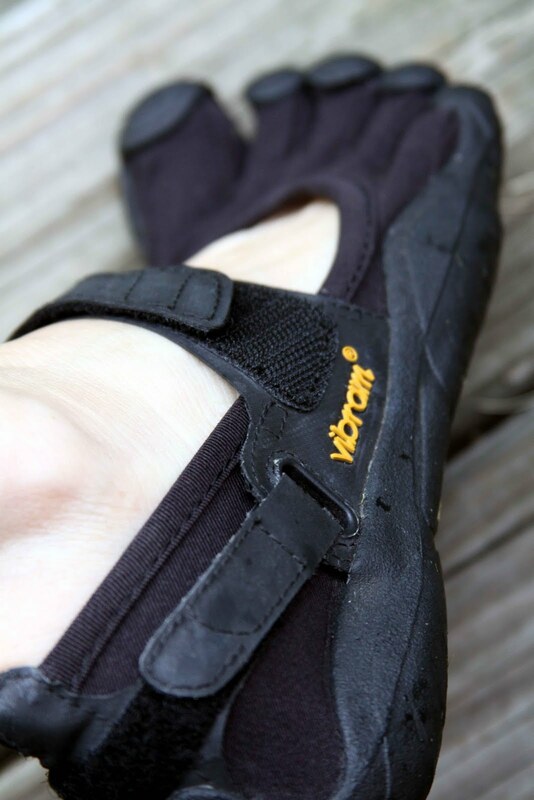 The Vibram's fix all that; a big feat for footwear. The release from the fears is so freeing. I love to be barefoot and now I can do it even when it's not commonly accepted like at the grocery store. I don't know about yours, but my market frowns on barefoot shopping. But I can do it now and they don't even know because I have my bare feet hidden in my barefoot shoes. Ha! I have begun to run in them too which was the main purpose for exploring these shoes anyway. I ran just yesterday and it felt great. Light on my feet, literally. As a concerned family member please be advised that those shoes will be banned from all family Christmas gatherings this year. I trust they do not come insulated for cold weather. Next thing you know, you'll be wearing the toe socks to go with them...which will insulate for the cold weather.